Aidan Chappell looks at the rise and fall of tailored menswear and finds the answer to our problems could be on our doorstep. Conceived in 2007, The Cloakroom was before its time. The sartorial renaissance had not occurred and so the menswear – and more specifically tailored menswear – market had not yet erupted into the deafening cacophony of brands whose singular purpose was to satiate the burgeoning style desires of Australian gentleman. As it so happened, the social media age – which conceived this phenomenon of #dapper #gentlemen – coincided perfectly with the globalisation of the fashion industry through the proliferation of platforms like Alibaba – allowing any Australian with a penchant for tailored menswear to contact any number of offshore manufacturing units and establish a ‘brand’ through which to on-sell their products here in Australia. Take it from someone who’s done it and visited the ‘factories’ in backcountry China – it’s easy. There are no minimum order quantities and the only expenses one must incur to setup are an initial outlay for fabric swatch books, a tape measure and some sample garments if you so desire testing the efficacy of your production. You don’t even need to visit the factory in which your garments will be made! 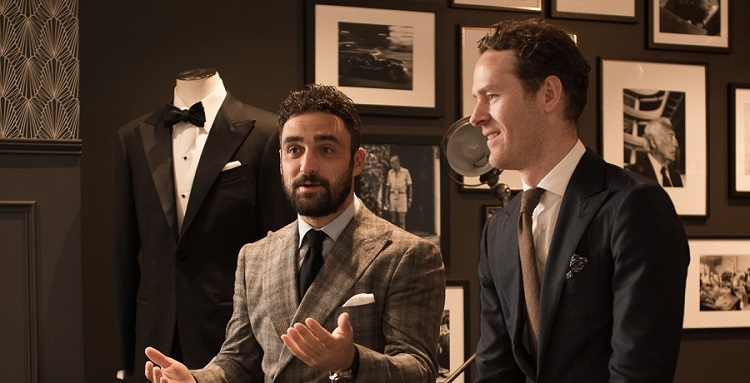 Alas, the ‘bespoke tailor’ has become an omnipresent feature of the retail landscape. Or has it? Actually, this notion that Australia is filled with ‘tailors’ providing ‘bespoke’ services is a total rort. A farce. A total sham. The reality is that many of these businesses are operated by young men who harbour zero capabilities as ‘tailors’ or aficionados of men’s style outside of fetishizing the likes of Harvey Specter, Ari Gold, James Bond and Jordan Belfort. The results are of course less than flattering, and sadly, leave customers anguished – forcing them to resort to the relative safety of off the rack suits, where they can at least be somewhat certain about what they’re in for. While all of this may not seem overly sinister on face value (after all, who doesn’t enjoy the Ari Gold paintball scene? ), it has conceived a culture that not only bastardises the true meaning of words like ‘bespoke’ and ‘tailor’, and all the ideas of quality and luxury that such terms entail, but one in which the true nature of products remains obscured in the eyes of the consumer. It is perhaps one of the finest exponents of misleading and deceptive conduct in our country! Yet for some reason, it goes unchecked. If that wasn’t enough, Australia’s #tailored #menswear revival appears to have propagated a culture of pretentiousness and arrogance among those within the industry. Instead of operating as a business that serves the client, you can’t help but feel these businesses serve to inflate the egos of their founders and employees – whose reward for effort lies not only in profiting at their customers expense, but in yielding free tickets to trackside marquees during the spring racing season and gaining compliments from one another on social media. It’s tacky, it’s gimmicky and it spoils the party for the few brands and businesses who abide by a higher standard under the same auspices of ‘tailored menswear’. And so we come full circle to The Cloakroom. Owners Andrew Byrne and Louis Ialenti are losing patience with being tarnished with the same #bespoke #tailor brush. After all, they were here before operating a tailored menswear business became a thing. But more than that, it’s how they’ve distanced themselves from the crowd that’s impressive. Without delving into the technicalities of tailoring, pattern making and how they’re able to manipulate garments with millimetre precision, what separates The Cloakroom is the philosophy under which the brand is governed, which mandates quality and authenticity above all else. Where many Australian menswear brands attempt to channel the essence of British tailoring royalty – selling an idea of heritage and tradition, albeit an unauthentic version featuring cheap scotch and even cheaper supermarket cigars that reek of pretension – The Cloakroom speaks a language of modern luxury that derives inspiration from a different source. While they offer impeccably tailored menswear – crafted by some of the most proficient artisans in Japan – the brand isn’t about tailoring per se, but is about emotion. They’ve extracted the essence of the world’s most luxurious brands and married it with tailored menswear – conceiving something that is not only unique to Australia, but the world. Testament to this, The Cloakroom has even transposed its DNA into an exclusive cocktail lounge concept, which now operates alongside (though separate) to their stores in Brisbane and Montreal. On that note, I forgot to mention that The Cloakroom now boasts three international locations; Brisbane – replete with menswear store, bar and barber; Montreal – replate with menswear store, bar and barber; and Tokyo – operating solely as a menswear store at this point in time. Yet despite all the evidence in the world pointing to the contrary, The Cloakroom – with their world class garments and service – is still likened to Australia’s tailoring riff raff, simply because of their association with the word ‘tailoring’. It’s a crying shame that a brand of such modesty and intricate quality (so much so that it has warranted the custom of Japan’s advisor to the Prime Minister) must be uttered in the same sentence as their feckless ‘rivals’. © Connection Online Pty Ltd.